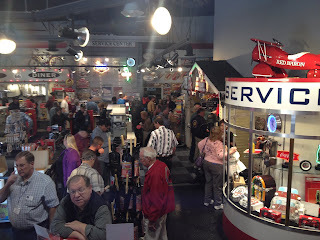 While I was in Sacramento for the Autorama, our friends at the Horseless Carriage Club of America stopped by our retail store for a tour on Saturday. The store was packed all day with club members and we wanted to make sure and thank everyone that stop by California Car Cover while on their visit. President's Day weekend meant a few more days on the road for me. This time around I headed north to the Bay Area and Sacramento. I stopped in San Francisco to visit some customers and attend a trade show. Photos from those stop will be detailed on our blog at a later date. The most excitement of the weekend came from my stop in Sacramento at the Sacramento Autorama. 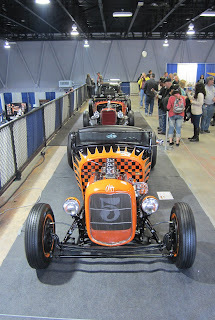 I had never been up to the Autorama before but I cruised over there on Saturday to check out the cars. 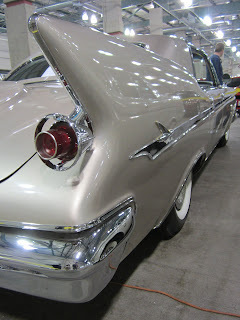 There were cars all over the Expo Center and I tried to get photos of just about everything. Whether you were into bikes, boats, muscle cars or classics, there was something to catch your eye at the show. California Car Cover was not exhibiting at the event this year, but maybe you will see us there in the future. The Expo Center had quite a few buildings so cars were spread out all over the complex. The smaller halls featured a lot of the audio video companies and car clubs. 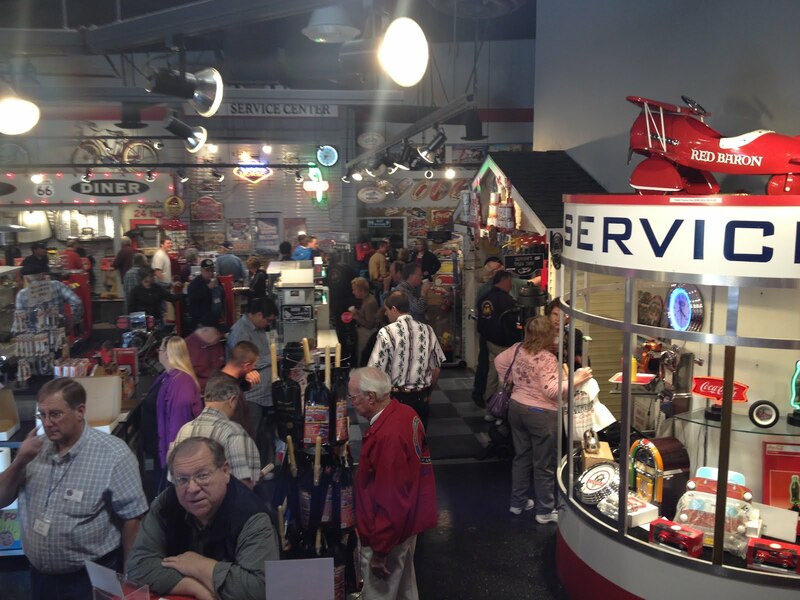 The smaller halls featured boats, vintage drag race cars and much more. Check out the wood work on that boat. I tried for a few minutes to get a photo of this hot rod without any people in it, but a future hot rodder would not quit taking laps around the car. I just gave up and here it is. In the main exhibition halls is where you could find the custom cars. There was plenty of candy paint and wide white wall tires everywhere. 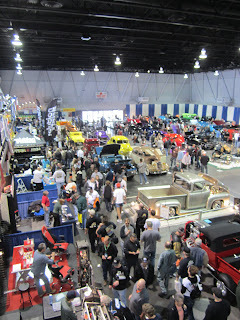 The Sacramento Autorama is promoted by the same company that host the Grand National Roadster Show, but it was nice to see a lot of cars that were not down in Pomona a few weeks ago. There were a few Lincoln Zephyr automobiles on display at the show. A view from above. The main floor had a lot of action on Saturday afternoon. Some classic and amusing decals. 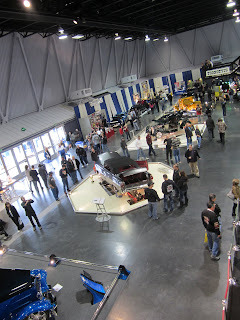 At the back end of the Expo Center was a large exhibition hall that housed a lot of car clubs. It was cool to see a lot of Corvette, Lincoln, Mopar, Pontiac, etc vehicles all parked together. 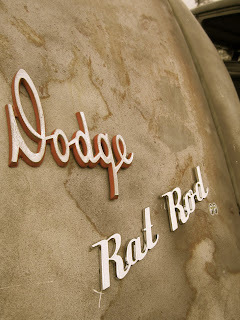 The traditional rod tent had a lot of bare metal and white wall tires. This 1934 Ford Tudor Sedan is owned by California Car Cover customer Brian Bates. Glad we were able to check out this clean hot rod at the show. This Ford was probably my favorite car at the show. It sure looked good under the lights. Quite a few wild and eye catching paint jobs on display in the main building. Outside there were even more cars to see and get up close to. Even though the weather was cool everyone was having a good time. I am back in the office this week making sure the March 2012 California Car Cover catalog looks great, but I am not sitting still for long. I am off to the Motor City this weekend for Detroit Autorama. I will have photos from that trip up here next week. Want to see more car photos? Check out our Flickr page for pics from all the shows we attend.